Join the discussion on our forums! Come discuss Boommaster Flark over in our dedicated Boommaster Flark discussion topic. Boommaster Flark has to be one of the funnest cards in the set and the ideas on how to use him are numerous. This may sound cheesy, but I have won many games just by using Stormwind Champion next turn after playing Boommaster Flark late in the game. You can use the bombs as attackers or you can ram them into objects and go Kaboomy all over your opponent. The benefits of using the bombs with cards that have magnetism means you can swing for greater attack (for example, Wargear or Zilliax. Here's another trick that I have learnt about using magnetism is that you can trigger a Goblin Bomb and Spider Bomb at the same time with a Fireworks Tech, or you can stack them with Replicating Menace, then use Terrorscale Stalker to trigger the Goblin Bomb and Spider Bomb twice in play, and you will also trigger the Replicating Menace once without dying. The amount of combos you can use with death rattle mechs makes playing them so much fun. Enjoy! A Goblin bomb? What the Flark? This card looks great in gold. I remember being excited for this card and now we know for sure that until Rexxar leaves, there is no room for clunky combo setups like this in hunter. At least I didn't have to craft him to get him! Here's to the departure of Rexxar; may April come swiftly, and may he leave gracefully. Also: I hope my fellow hunter players don't cry too much about the most OP value card hunter has ever gotten leaving for wild. I have a golden one, should I turn it to dust? Asking myself the same question, I play some Hunter decks but I did not need him for any of those decks. When boomsday was released I played around with some deathrattle hunter deck variants utilitzing spider bomb and would have liked to try him but didn't wanna craft him, I played explodinator or giggling inventor instead and removed explodinator out of every deck by now. Giggling Inventor has a different purpose because of taunt/divine shield though. To each his/her preference of course. I'm SO HAPPY i got him within the first few packs! 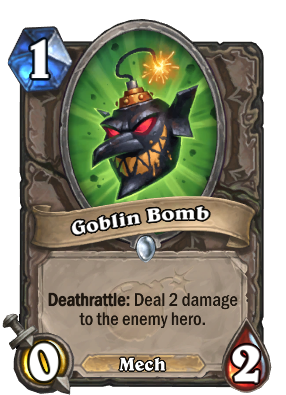 I play him in 2 decks right now (Standard-Wild) and killing my opponents with my Goblin Bomb ARMY is so FUN| MHUAAHAAHAAAAA! KABOOOOOOm!!! 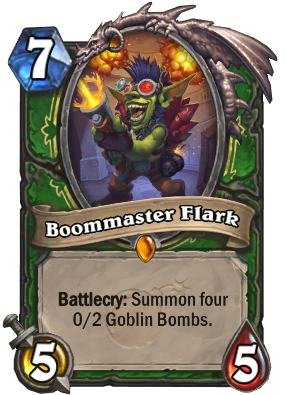 Also to the naysayers out there, its not only about the 4 Goblin Bomb that comes with my very good friend Boommaster Flark. Its also about the 8-12 others that comes with Spell and Minions, the trigger Deathrattle/Magnetic mechanism and etc that will make up your deck. He's more talkative than Dr. Boom, at least.